Yeppers! It’s a First Friday Giveaway! Looking at this photo you could think I’m a month off, or I’m a little off! I can’t confirm nor deny the latter (ha! ), however, I can agree that this month’s giveaway items look like they belong in October. There’s a reason for that. By the time the giveaway is over and the prize is mailed to this month’s winner, many teachers will be making plans for October—so October-themed goodies it is! 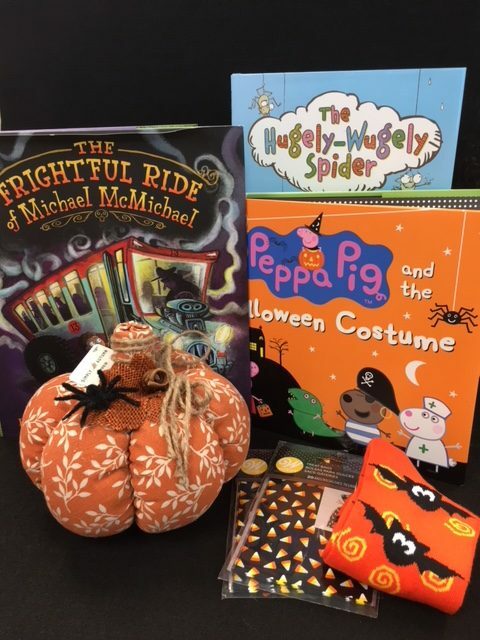 To enter for a chance to win a decorative pumpkin for your classroom, a pair of batty toe covers, 40 treat bags, and three super fun picture books, simply leave your answer to the following question right here on this blog no later than Sunday, September 16, 2018. What do you like most about fall? I’m going with the weather, yet I love fall clothes, pumpkin beverages, football, Halloween—I can’t decide! Can you? Eager to hear from you! Congratulations to Deb R. from Lake Benton, MN; the winner of this month’s First Friday Giveaway! I like seeing the leaves change colors. Pumpkin Spice and everything nice …. fall colors, cooler temperatures … what’s not to like about Fall…? Pumpkins scents…. beautiful colors…. it is all wonderful! I love the crisp clean smell! Absolutely everything – cooler weather, scents, football, Halloween . . . I love the beautiful colors of the leaves changing and football season- cheering for my Michigan State Spartans. I love everything about fall- colors, smells, food, my anniversary, and of course FOOTBALL!!! I love the cooler weather since I’m going through early menopause! I also love all Halloween decorations creepy cool!!! I like anything and everything Fall. I love pumpkin baked goods (especially with yummy cream cheese frosting! ), leaves changing colors, and warm clothes! I like the cooler weather and the changing of the leaves. I love the cooler weather! Being able to cuddle inside a warm sweatshirt is the best! The decorations, and a new season of clothes. Leaves changing colors, cooler weather, decorating for fall, and fall sensory tables for the children. I love everything! The cooler weather, leaf colors, pumpkins and Halloween. My most favorite is teaching my preschoolers all about fall! I love the cool weather, changing of leaves and pumpkin spice coffee. It is so pretty to just be outside when fall starts. Halloween and having the windows open. Love the cool brisk air and the colorful fall foliage???? Cool weather. Leaves changing colors and pumpkin and apple pickikg. I love the cooler weather, football season, and the color of the leaves! The weather cools off and the baking begins! I love the beautiful fall colors. Cooler weather, and OSU football! I love the smell of the leaves and picking apples! I LOVE how fall feels festive- it’s like the kickoff for the holiday season!! I think I love the smells of chrisp autumn air, football leather , a new crackling fire and pumpkin pie ! I love smelling my cozy clean blankets as I’m wrapped in them, writing my school plans! I love the smell in the air as the weather begins to change, the colors as the leaves change and the feel of my home …. becomes much more cozy. I love Halloween and seeing the leaves change colors. I also enjoy our annual trip to the apple orchard and pumpkin farm! Pumpkin spice everything and cooler, crisp weather! If I am being honest, my most favorite thing is that the H-O-T and H-U-M-I-D Georgia summer finally decided to dissipate toward mid October. It’s currently still 90 degrees! I also love seeing the beautiful colored leaves in the North Georgia mountains and all the fall festivals where our family can indulge in boiled peanuts, caramel apples, cider slushees, funnel cakes and s’mores! I love the beautiful fall colors!! My favorite thing about fall is all the fun craft activities! It’s sweater weather!!! Beautiful time of the year for long walks in the park. Cooler weather, but not cold enough for a coat, and the smell of leaves. I love how excited the kids are for Halloween and planning their costumes! Apples, cider, and just the beauty fall brings…jumping in the leaves is the best!???????????? I love the fall colors and the pumpkin spice!! In the fall, I love to see the colors of the leaves. I adore the breeze blowing and making the fallen leaves rattle across the pavement. And all the fall festivals make everything more enjoyable for everyone! Beautiful Fall colors and cooler weather. Colors, weather, football, warm food/drinks, family gatherings! I love sitting on my porch, listening to the high school marching band, hoodies and pumpkin pie, rain on an autumn day that mutes all the vibrant colors, choosing that perfect pumpkin and teaching my littles ones Halloween songs. And especially Halloween Candy! I love the crisp fall air, the colorful mum’s, leaves turning beautiful colors, and the way the leaves fall to the ground covering it like a blanket. Fall means my favorite time is right around the corner. Winter is coming!! I like that the air becomes cooler after a long HOT summer. Also Halloween is in the fall! Fall means football, foliage & familt feasts! I mean family feasts! LOL! I LOVE the fall holidays! Halloween & Thanksgiving! -Food, fun, and family can’t be beat! I love pumpkins! Cooking, decorating, they are so much fun! I love the cooler weather, the leaves changing colors, Halloween, Thanksgiving and anything pumpkin flavored!!!! My allergies go away and it cools down! I love the ripening apples and pumpkins and the obligatory trip to the farms to get them. I also love Halloween! It is so much fun to dress up and pass out candy to all the cute trick or treaters! My favorite is the fall decor! I love the cooler weather and the changing of the leaves. The colors are magnificent! It’s a chance to pull out sweaters and blue jeans and get comfortable, or at least it used to be. I live in AZ now and sweaters aren’t really needed here and fall weather isn’t what it is in NY. I have my memories though! Sitting on my porch swing watching the sunset. Walking in the woods and hearing the crunching of the leaves. I love the changing leaves and all the smells of fall. I love all the colors and the Fall scents. Apples! It’s the beginning of comfy sweaters/sweatshirts and comfort food, too. Chilly weather that allows me to wear my hand-knit scarves and mitts ???? I love wearing sweaters again and watching football while admiring the fall foliage, with a PSL in hand of course! I love fall for the start of the holiday season. I Fall, because I love how the weather starts getting cooler; taking trips to the pumpkin patch with my kindergarteners; and gearing up for the start of the Holodaybseason. The colors, cooler temperatures and candy corn!! My nana would take my brother and I to the candy counter at the mall and my brother would get gummy bears and I would get candy corn. I still love to candy corn when they bring it out in the Fall. Cooler weather, so that the classroom isn’t so hot! Plus I love all the fall flower colors and floral arrangements you see in stores. My favorite things about fall are the temperature change, leaves changing color, and pumpkin picking with my prek class! ???????????????????????????????????? My forty minute commute to school magically transforms into driving through a mountainous, fall color explosion work of art! Windows down, cool, crisp air, sunshine setting the trees on fire! Who couldn’t have a great day with 26 first graders!?!?! I love the leaves changing color and the kids dressing up. I love the changing of the leaves, school carnival, football games, marching band, and preparing for the holidays!???????????? I love everything. Fall is my favorite season! The cooler weather and going and picking out pumpkins from the pumpkin patch with the kids in my classroom. I’m also really excited because it will be my daughters first time to go do it herself now that she’s old enough. The weather!!!! I think it’s so pretty and relaxing when there’s a chill I’m the air and the leaves are all changing color. I love all the fall activities! Pumpkin and apple picking, Halloween parties and trick and treating, and apple cider donuts! The cooling temps that invite hoodie-wearing! What’s not to love about fall? It’s my absolute favorite time of year! I love the crisp weather and apple picking! Leaves changing and the cool crisp air ???? I LOVE apple and pumpkin picking with my husband and son. I love fall clothes and cooler weather!! Turning the oven on again! I enjoy fall for the lovely New England colors, The Big E, and it means Halloween is around the corner! I love the cool crisp air and changing leaves! My favorite thing about fall is the changing of the leaves. As a toddler teacher, I’m reminded that my little guys have only experiences this once or twice in their lives and it’s a good reminder to me to hold on to that sense of awe and wonder and just experience the world through their eyes. I love the cool weather and all the pumpkin spice flavored food. Football, cooler weather, and transitioning from iced to hot coffee! Plaid button downs and overalls! My birthday is in October! The crispness in the air and more fun outside! Layered clothing – short sleeves and a sweater. Also nice recess weather!! I LOVE the crisp feeling in the air! I enjoy going apple and pumpkin picking with my family! I love that first fall fire in the fireplace! Cozy sweaters and mugs of coffee or hot chocolate and a good book all in front of the fire!! Cooler temps, changing colors, and having a great start to the school year are what I love about Fall! I love the change in the weather and the fall colors. Driving with my car windows down and letting the cool fall breeze in. Lighting fall scented candles like Pumpkin Spice, Apple Cider, and Crisp Fall Leaves. And sipping on seasonal drinks from Starbucks! Pumpkin Spice Lattes are one of my favorites! Love seeing the leaves changing creating a beautiful masterpiece painted by Mother Nature! The crisp cool air, apple and pumpkin picking. Halloween and the excitement on the children’s faces collecting their trick or treats. The warm cozy sweaters along with the smell of wood burning in the fireplaces. Fall to me is the official beginning of the holidays! It’s my my favorite season of all! I live in Florida so unfortunately no beautiful change in the leaves but that’s my favorite thing about fall. I also absolutely love everything pumpkin flavored. Cool, crisp, but still sunny days! I love the fun family activities we do—corn maze pumpkin carving and cooler weather. I love looking at the fall foliage and enjoy the cooler temperatures. I love the cooler weather, fall clothes, holidays, and apple and pumpkin foods. I Like the change in weather, the fall crisp air and the beautiful tree colors, ever changing! Harvest moon, apple cider, pumpkin pie and giving out candy at Halloween. The thing I love best about fall is all the activities! Everything from apple picking, pumpkin patches, leaf hunts, jumping in the leaf piles, having bonfires with s’mores, going camping, building scarecrows, going to haunted houses, trick-or-treating, and best of all, making all the fall foods! I love bringing out my plaid scarves, chunky cardigans, munching on pumpkin candy corn and coming home from school to a house that smells of yummy chili simmering in the crock pot! ❤️???????????? Snuggling up in oversized sweaters! I love the cooler weather and the colors of the changing leaves. I love the changing color of leaves and the cooler temperatures! I love the changing colors, pumpkins and the cooler weather. When I leave work on a sunny day to go home, I see all the various colors in trees and the hillsides. But the best is the colors making it almost look like a fire: the sun makes the colors so vibrant at certain times of the day. I LOVE everything about Fall! Watching the leaves change into such beautiful colors has to be my favorite! Going for a walk through our state park and taking it all in….the smell of leaves, the cooler temps, the colors. I feel it soothes my soul and brings me peace. I love the cool crisp feeling in the air. The crunch of shiny apples. The glow of orange pumpkins and the colorful falling leaves. I love the beautiful colors of the leaves, especially after it rains. The leaves changing color. Watching the leaves rain down on me. Driving through the leaves as they are falling. The crisper, cooler mornings and evenings. Lots of things, but let’s go with leaf crafts and candy corn! Love the crisp coolness that lets you brings out sweaters and hoodies! The beautiful colored leaves, crisp air, and sweatshirts! I like the changing colors. The orange and mustard yellow. I love pumpkin and scarecrow everything. I love to decorate for it. More and more pumpkins. Fall is the most beautiful season with all the colors changing on the trees. I look forward to the weather changing as well.